Chapter headings and selected papers: Introduction. Contracted Porphyrins. Introduction. Corrole. Isocorrole. Contracted porphyrins containing fewer than four pyrrole-like subunits. Isomeric Porphyrins. Introduction. &lsqb;18&rsqb;Porphyrin-(2.0.2.0) ("porphycene"). &lsqb;18&rsqb;Porphryin-(2.1.0.1) ("corrphycene" or "porphycerin"). &lsqb;18&rsqb;Porphyrin-(2.1.1.0) ("hemiporphycene"). &lsqb;18&rsqb;Porphyrin-(3.0.1.0) ("isoporphycene"). "Mutant" or N-confused" porphyrins. Future directions in porphyrin isomer chemistry. Expanded Porphyrins Containing four Pyrroles. Introduction. Homoporphyrins. Vinylogous porphyrins (odd-odd systems). Stretched porphycenes (even-even systems). Heteroatom-containing stretched porphycenes. Odd-even systems. Miscellaneous systems of interest. Contracted Expanded Porphyrins: Sapphyrins and Smaragdyrins. Introduction. Sapphyrin. meso-Aryl-substituted sapphyrins. Heterosapphyrins. Optical properties of sapphyrins and heterosapphyrins. Metal complexes of sapphyrins. Three-dimensional sapphyrins and sapphyrin conjugates. Smaragdyrins and heterosmaragdyrins (norsapphyrins). Other Carbon-bridged Pentapyrrolic Systems. Introduction. Orangarin: two bridging carbons. Isosmaragdyrin: three bridging carbons. Sapphyrin "Isomers": four bridging carbons. Pentaphyrins. Other systems. Carbon-linked Hexapyrrolic Systems and Heteroatom Analogs. Introduction. Hexaphyrins. Rubyrins and heterorubyrins. Rosarins. Rosarinogens and heterorosarinogens. Bronzaphyrins. Amethyrins. Other systems of interest. Higher Order Systems. Introduction. Turcasarin: decaphyrin-(1.0.1.0.0.1.0.1.0.0). Cyclooctapyrroles. Pyrrole-thiophene decamers: hexathiatetraaza&lsqb;44&rsqb;decaphyrins-(2.0.0.0.0.2.0.0.0.0). Nitrogen-bridged Expanded Porphyrins. Introduction. Schiff base-derived expanded porphyrins. Other nitrogen-bridged expanded porphyrins. Cryptand-like expanded porphyrins. Applications. Introduction. Magnetic resonance imaging (MRI). Photodynamic therapy (PDT) and photodynamic viral inactivation (PDI). X-ray radiation therapy (XRT) enhancement. Antisense: applications. RNA hydrolysis and DNA photolysis. Expanded porphyrins as anion-binding agents. The porphyrins are a class of naturally-occurring macrocycles and are ubiquitous in our world. As such, they have been called the Pigments of Life. This auspicious designation reflects their importance in numerous biological functions. Indeed, life as we understand it relies on the full range of biological processes that are either performed by or catalyzed by porphyrin-containing proteins. Chlorophyll-containing photosynthetic reaction centers in plants, for instance, convert light energy into chemical energy while producing oxygen along the way. It is this oxygen, evolved from photosynthesis, that is transported, stored, and reduced by heme-containing proteins in many organisms, including mammals. Not surprisingly, therefore, these molecules remain of fundamental interest to chemists and biochemists. Indeed, they continue to be intensely investigated by researchers world-wide. Inspired by the importance of the porphyrins, a new research direction has emerged in recent years that is devoted to the preparation and study of non-porphyrin polypyrrole macrocycles. Here, the principal objectives have been to generate completely synthetic systems that bear some structural resemblance to naturally-occurring porphyrin derivatives while being quite different in their specific chemical makeup. Within this context, three different research directions have evolved, namely those involving the syntheses of contracted, isomeric, and expanded porphyrins, respectively. It is the chemistry of these systems that is the subject of this book. 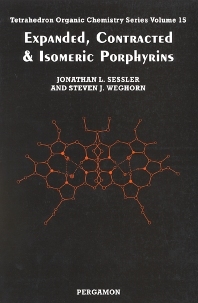 Because of the newness of the field, the emphasis of this book will be on synthesis and characterization (all work on porphyrin isomers and much of that associated with expanded porphyrins has only appeared in the last 10 years). One chapter on applications has, however, been included. Also, in the context of the preparative portions of the text, some efforts have been made to explain why various porphyrin analogue targets are of interest. For organic chemists, medicinal chemists, pharmaceutical company researchers, university and industrial researchers, graduate students.